Most economical & sturdy rotomoulding machine to produce large size product up to 40000 ltr. capacity. Application: Suitable for large size cylindrical vertical container and other similar products. Also used for roto lining of products. Most economical & sturdy rotomoulding machine to produce large size product up to 40000 ltr. capacity. Suitable for large size cylindrical vertical container and other similar products. Also used for roto lining of products. 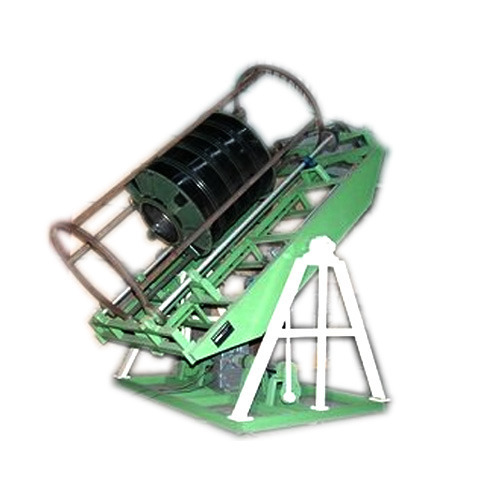 Made from heavy duty mild steel structure made of channel with support frame & tripodal structure with all relevant accessories. Low cost plant for huge size product with high production capacity & easy to operate. Low & high pressure individual adjustable gas burners for efficient & effective burning & trouble free service for long time. Cooling station with rolling drive with mild steel structure with gear system is provided. All motors are branded with branded gear box with variable A/C speed controlled mechanism is provided, the speed is controlled with balanced pulley drive. All in one separate operator console powder coated, fabricated from mild steel sheet. Main volt & Amp. meter with selector switch, pilot lamp for each motor & RYB phase, special A/C variable drive as per customer requirement can be arranged for fixed & smooth RPM control. The quest for innovation, excellence & quality begins at N.A.Engineers, it is not just a process of production but a way of life every Day. We are determined to achieve excellence, innovation & customer satisfaction to the fullest in the field of Rotomolding Machine Manufacturing.